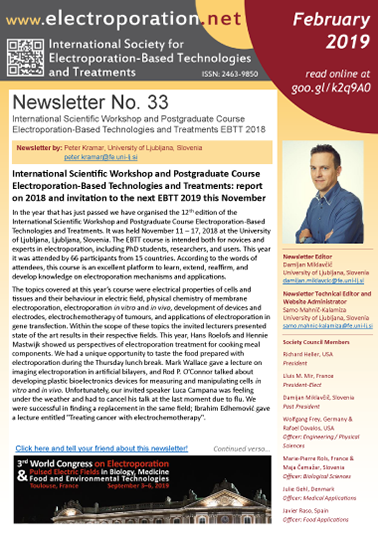 ISEBTT :: The International Society for Electroporation-Based Technologies and Treatments – The official site of the ISEBTT. Any and all inquiries are welcome at isebtt@electroporation.net. Notice to all visitors: The old www.electroporation.net (COST TD1104 Action’s homepage) is now available at cost.electroporation.net. The site you are currently browsing, the new www.electroporation.net, is now the official website of the ISEBTT. 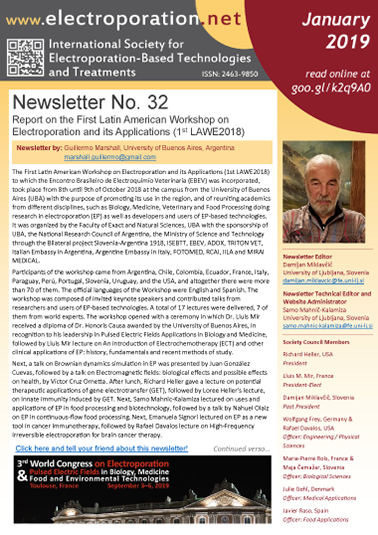 The mission of the International Society for Electroporation-Based Technologies and Treatments is to promote the advancement of scientific knowledge of the interactions of pulsed electric and electromagnetic fields and ionized gases with biological systems (cells, tissues, organisms, molecules and materials), with an emphasis on electroporation, and to facilitate the development of applications based on these phenomena in biology, medicine, biotechnology, and food and environmental technologies. The Society is headed by the Board of Directors, i.e. the Council. You can find our Council members on the Council page. Those involved with establishing the society are also listed there. Our bylaws and other documents can be found under Publications – Society Documents.